Quicken has the ability to keep track of all of your loans — not just how much you owe, but how much you pay each month, how much of that payment is interest, and how much of that payment reduces the amount you owe. 1Click on Property & Debt Center on your Account Bar, and then click Add Loan. A Loan Setup wizard pops up onscreen. 2With the EasyStep tab selected, click Next to open the Loan Setup wizard. Quicken asks questions about your loan. If you don’t have the loan documentation at your fingertips, you change your information later. 3Indicate if you are borrowing money or lending money, and click Next. 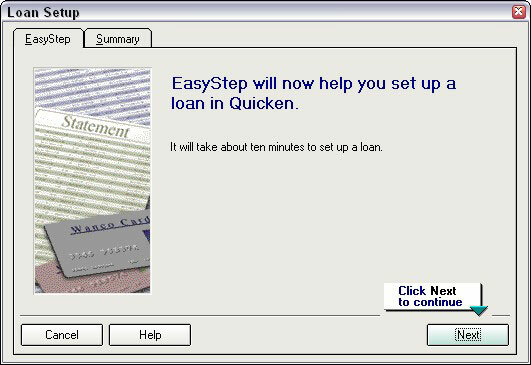 Quicken sets up loan accounts and classifies them as a receivable or payable. For this example you’re borrowing money. 4Give this loan a name and click Next. Think of something meaningful, such as Auto Loan or Mortgage or Loan to Sister. 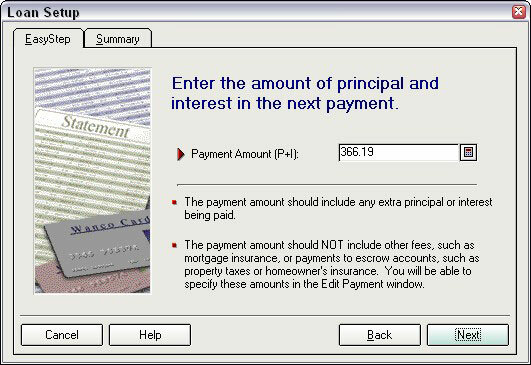 5Let Quicken know if you’ve already made payments on this loan and then click Next again. If you coordinate starting a loan with setting up Quicken, the setup process is a bit less messy. If you already had a loan when you decided to set the loan up in Quicken, you enter information like how much you’ve already paid on the loan so that Quicken can keep up with you from now until the payoff day. 6Enter the starting date of the loan and the original amount you borrowed, and click Next. Enter the starting date, or a close approximation of when you borrowed the money and then enter the initial amount of the loan. 7Answer the Balloon Payment question, and then click Next. Often balloon loans are structured so that you pay only interest for your monthly loan payments, and then pay the entire principal at the end of the loan. 8Enter the length of the loan. Your options here are years, months, weeks, and payments. Use payments if your loan is based on the number of payments you’re going to make. Even if you plan to make extra payments, enter the frequency that the lender expects for your payments. Your loan document should specify the compounding period, and your lender should certainly be able to tell you. 11Enter the current balance of the loan. If you know the current balance of your loan, answer Yes and then enter the balance as of today’s date. If you don’t enter the balance, Quicken does the calculations and tells you what your balance is within a few pennies. 12Enter the date of your next payment and the amount. Enter the date your next payment is due, even if that is not when you actually plan to make the payment. The loan papers or your lender can tell you what rate of interest you are paying on this loan. 14Review the summary and click Done when you are finished. Clicking Next after you enter your interest rate takes you to the Summary tab, where you can review all of the information you just entered. Click Next a couple of times to get through the summary screens. Make any changes that might be necessary if you entered information incorrectly, and then click Done to save your loan information.